OLED displays are made from organic emitter materials - and are gaining in popularity as these next-generation displays offer excellent image quality and novel form factors. The OLED display market is estimated at over $25 billion in 2018 - and is set for fast growth. Quantum Dots are tiny particles that have excellent photonic emission properties - and are used widely today in many LCD displays as the QD photoluminescence features enable the conversion of blue LED light to red and green light to create full-color displays that are better than white-backlit LCDs. QD particles can also be used to create emissive displays, in which the QDs themselves emit the light - this technology may prove to be the successor to OLEDs as QDs could prove to have higher efficiency and a larger color gamut (narrow spectrum emission). Several companies are looking to develop hybrid displays that use both OLEDs and Quantum Dots. There are several possibilities - to create displays in which some of the emitters are OLEDs and the rest are QDs, or to use QDs to convert blue OLED emission to a full color displays. 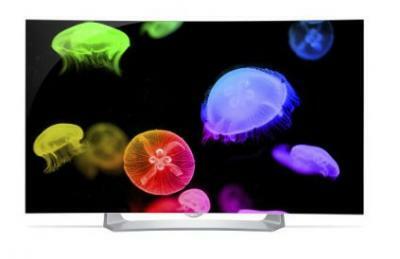 Samsung has been developing a hybrid QD-OLED TV technology, that adopts blue OLED emitters and quantum-dots that convert the blue light to red and green light. Samsung hasn't committed yet to this technology, but it is expected that the South Korean display maker will start QD-OLED TV production by the end of 2019. 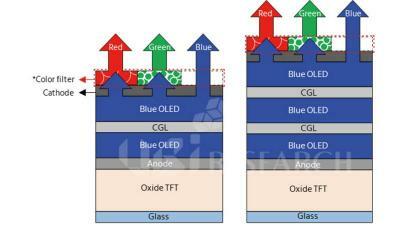 Samsung plans to convert its L8-1 8.5-Gen LCD fab to QD-OLED production. This will likely begin in the second half of 2019, but this will be a gradual conversion. The L8-1 has a current monthly capacity of 200,000 substrates, and following the conversion the capacity will be around 160,000-180,000 substrates. The mass production ramp-up will begin in 2020, and Samsung's total investment in QD-OLED technology and production in 2019-2021 will reach over 10 trillion Won (around $8.95 billion). According to our information, Samsung is using a fluorescent blue emitter (will hopefully change to a higher efficiency one in later generations) and ink-jet printed QDs (in collaboration with Kateeva). In March 2019 it was unveiled that China-based display maker TCL is developing a new hybrid display technology that uses a blue OLED emitter coupled with red and green QD emitters. 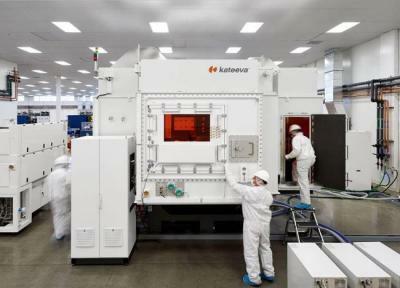 All three emitter materials will be combined and printed using ink-jet printing technology. TCL calls this technology H-QLED and this could prove to be the technology of choice for TCL's future high-end emissive TV displays. For more information on TCL's H-QLED, click here. According to reports, Samsung Display will hold an investment review committee on April 2019 to decide whether to go ahead with plans to start producing QD-OLED TV panels. If the plan is approved, Samsung will start installing production equipment towards the end of 2019, with mass production starting by the end of 2020 or early 2021. According to earlier reports, Samsung aimed to start pilot production of QD-OLED TV panels in 2019. It's not clear whether the new reports suggest a delay or whether they only refer to the mass production step, with pilot production proceeding as planned. DSCC says that production costs for a 55" QD-OLED TV panel at Samsung Display's 8.5-Gen fab will reach almost $800 in 2019. While this will fall to around $450 in 2022, Samsung will still lose money on every panel sold if DSCC has its price and cost estimates right. It is important to note that most of the cost is depreciation costs - which means that in terms of cash on each panel, SDC's margins will actually be around 40%. Part of the reason for he high cost of required equipment is the need to use 12 TFT masks.. SDC is apparently looking to reduce the mask number which will lower production costs. Samsung Electronics reported its financial results for Q4 2018, with revenues of KRW 59.27 trillion ($53 billion USD), down 10% from Q4 2017. Samsung's operating profit of KRW 10.8 trillion ($9.6 billion) was down 29% from 2017. Samsung Display reported a decline in rigid smartphone OLED display sales - due to rising competition from LCD panels. 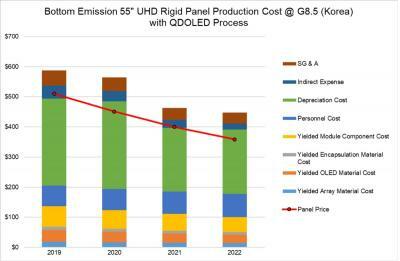 Demand for flexible OLEDs was strong. In Q1 2019, OLED display sales will remain weak - but Samsung says that flexible OLED demand will pickup in the second half of 2019. According to ETNews, Samsung Display has made significant progress with its OLED ink-jet printing process technology, and the company now aims to apply this technology to produce medium-sized panels for OLED laptops and OLED monitors. Samsung may also use this process to produce smaller tablet displays. 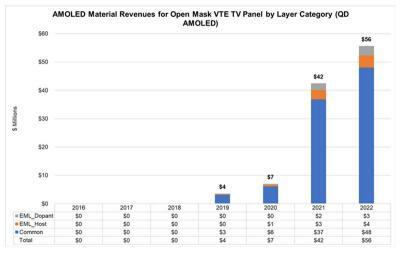 It seems that Samsung is aiming to settle on three main next-generation OLED technologies - evaporation (FMM) OLEDs for small-sized display, ink-jet OLED deposition for medium-sized panels and hybrid QD-OLEDs for large-area OLED TV panels. 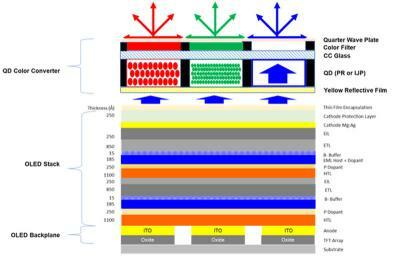 It's other display technologies are QD-LEDs for TVs and Micro-LEDs for next-generation small and large area displays. Samsung Display is developing hybrid QD-OLED TV technology, and according to estimates, the company aims to begin trial production in 2019. It seems that Samsung is managing to overcome the technical challenges and the company is preparing to start production of such QD-OLED TVs in 2019. Last month Digitimes updated about Samsung's plans to start installing equipment by the end of 2018 and begin trial production in H2 2019. 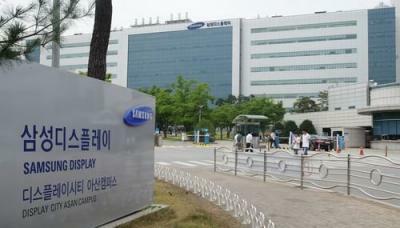 Digitimes now posted another article, revealing more details on Samsung's plans. In April 2018 Samsung announced it is developing QD-OLEDs (hybrid Quantum Dots - OLED) TVs. Later reports suggested that the company is building its first production line, with aims to begin pilot production in 2019. 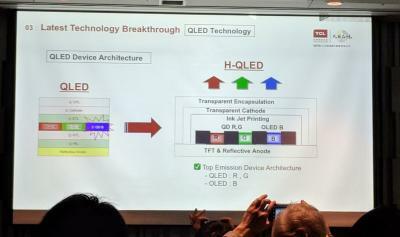 According to a new report from Korea, if Samsung's initial QD-OLED development is successful, it plans to convert an existing LCD line (SDC's 8-Gen L8-1 line) to QD-OLED production in 2020. Samsung's projected investment in its QD-OLED production will exceed $8.8 billion between 2019 and 2021. DSCC estimates that Samsung will begin pilot production of QD-OLEDs in 2019, with a capacity of 5,000 monthly 8.5-Gen substrates. If this is successful, Samsung will double the capacity in 2020 and add a further 30,000 yearly substrates in 2021 and again in 2022. Material revenues for Samsung's QD-OLED TVs will reach $56 million in 2022. DSCC admits, though, that as Samsung faces several technical challenges before it could launch commercial QD-OLED TVs, its forecast could be way off - there's a good chance that SDC will cancel the project, or it could increase capacity at a much faster rate than DSCC estimates and even scale-up production to 10.5-Gen.